ON this summer afternoon, the Andy Warhol’s New York City Tour does not begin at any location where the artist lived, worked or partied. Instead, it starts at 1060 Park Avenue. That is where Truman Capote was living with his mother in 1952, and where a young worshipper from Pittsburgh, Andy Warhol, could once be spotted, standing outside. To say that Mr. Kiedrowski has a passion for all things Warhol would be an understatement. Bald and beaming, he owns close to 175 books about the artist, who would have turned 83 on Saturday. He has just published his own addition to the pile: “Andy Warhol’s New York City: Four Walks, Uptown to Downtown.” Vito Giallo, who ran an antiques store frequented by Warhol, contributed illustrations. The pocket guide is almost as sweet and earnest as Mr. Kiedrowski himself, who, since 2004, has studied phone books from the early 1960s to pinpoint addresses in Warhol’s life, immersed himself in the history of those buildings and befriended aging Warholites. “They have become family to me,” said Mr. Kiedrowski, who is 37 but seems a decade younger. His meticulous guide reimagines Manhattan as Andy Land. Mr. Kiedrowski stood in front of 1342 Lexington Avenue at 89th, an 1889 Northern Renaissance row-house where Warhol lived from 1960 to 1974, much of that time, like Mr. Capote, with his mother. Although Warhol died at age 58 in 1987, celebrations of his myth-making life as a Pop artist, filmmaker, magazine publisher, music entrepreneur, shopper, scene maker and gossip keep surging. Mr. Shiner said the museum will send exhibits to Singapore, Istanbul and Mexico City. “Pop!” a musical about Warhol, played in Washington this summer. Mr. Kiedrowski, who receives about two dozen tour requests a year (warholtour.com), took one Australian fan on a tour that lasted six hours. Warhol has been a spiritual light for Mr. Kiedrowski since he was a teenager in a blue-collar family just outside of Milwaukee. “I was a little lonely and I didn’t know I was gay till the end of high school,” he said. An indifferent student, he thought he would become a factory worker. Then he read David Bourdon’s 1989 biography of Warhol. After high school, Mr. Kiedrowski followed a boyfriend to Alabama, where he worked in a sock mill. Eventually he returned to Milwaukee, where he graduated from the University of Wisconsin-Milwaukee, majoring in film production. He worked as a go-fer for a C-minus list Hollywood couple. When that position crumbled, he moved to New York, in 2002. Mr. Kiedrowski found work at companies that produced Web sites. At first, he had few acquaintances. But he kept Victor Bockris’s 1989 biography of Warhol on his office desk. 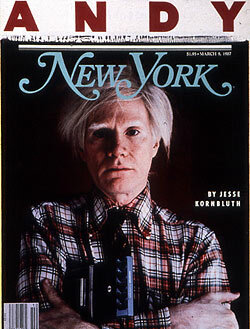 He became an Andy-didact, reading about society and art in New York during the Warhol decades. No Warhol film was too eye-glazing for him. When the Web site company folded two years ago, he collected unemployment and more Warholiana. A fellow Warholite suggested he offer tours. Another prodded him to approach the Little Bookroom, which publishes guides. He was astonished when the company welcomed him, as if Warhol were rewarding him for his hard work. The tour continued. He stopped at churches where Warhol prayed regularly, paused at his prime address at 57 East 66th Street (completed April 30, 1902, notes his book) and headed downtown, spending a reverent moment before 213 Park Avenue South, which used to be Max’s Kansas City, the famous club. Mr. Kiedrowski arrived at the temporary Andy Monument in Union Square. Tourists gawked at the chrome statue by Robert Pruitt of Warhol carrying a Bloomingdale’s Medium Brown Bag. “Is that Andy from ‘Toy Story’?” a woman asked. How would Mr. Kiedrowski celebrate Warhol’s birthday this Saturday? A party with elderly Warholites had already been held Tuesday evening. An article on Aug. 4 about Thomas Kiedrowski, who conducts Andy Warhol-themed tours of New York City, omitted part of the name of his alma mater. It is the University of Wisconsin-Milwaukee, one of 13 universities in the University of Wisconsin system; it is not the “University of Wisconsin”.